We would like to invite adult students of Italian, as well as members and friends of the ICC, to join us for a very special evening at La Cucina di Nonna Rosa Ristorante Italiano in Robbinsdale, Monday, June 17, 2013. The festivities will begin at 6:30 PM. Entertainment will be provided by native Italian musician, Pietro Benso. A highlight of the evening will include a short discussion of Italian wine provided by wine expert Alfonso Aiello. Join us and utilize your knowledge of Italian, listen to (and sing) some Italian songs, and learn a bit about Italian wine. Dinner will include choices in four courses, coffee or soda. There will be a cash bar. As always, orders will be taken by our own native Italian "cameriere". We will welcome all levels of Italian proficiency, and ICC instructors will be present to assist us in keeping the Italian conversation flowing. Cost for the event is $39. If you wish to participate, please remit payment, with the attached Paypal link, by Thursday, June 13th. 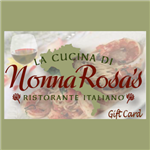 You can check Nonna Rosa's out at www.nonnarosaswinebar.com or contact Peggy at info@theitalianculturalcenter.org with questions. All events must be cancelled at least 72 hours in advance of an event to receive a full refund, less administrative costs.